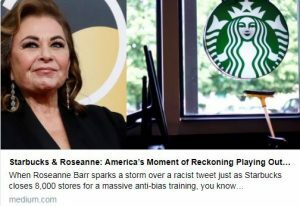 Today’s interconnected world made it clear to #Starbucks that they need to make a serious move if they wish to maintain good business, just as it made ABC move quickly to cancel #Roseanne’s hit TV show. When the light shines, one feels that he is ruled by the force of the Creator, which allows him to make actions opposed to rational, egoistic reason. He happily relies on the Creator, wishing to exalt Him with actions of bestowal. One reveals a new world. Don’t judge someone until you’re in their shoes. They say a person must always remain human, but fear and despair can transform him to the point that he does unthinkable acts. Our task is to reveal the force of faith above reason, bestowal instead of reception. To live by it, immersed in its field, to relate to reality and friends only with it. Then we’ll create connections between us built upon bestowal above reception—this is the soul’s formation! When the force of bestowal is revealed in a person, he feels pleasure from actions opposed to his natural egoism. He takes care not to lose the force of bestowal. But he must strengthen knowledge, the ego, in order to rise above it, in actions above knowledge, in faith. There should be competition. But the goal decides everything. If the aim isn’t to crush your opponent, but to attain the goal, a 3rd factor, then my attitude to the opponent isn’t “it’s me or him,” but to attain the goal and advance. Then he isn’t my opponent, but an aide/partner. We’ve turned all our necessities into sources of pleasure, an entertainment business. But happiness is more elusive than ever. Affluence deprives us of freedom and pleasure. No desire—no pleasure. So we’re left with no choice but to search for life’s meaning—the Creator’s plan! Always try to find pleasure in bestowal, thoughts of the Creator. And vice versa: although you receive and enjoy the reception, you must realize that it’s the beast in you that enjoys, while the soul is separated from the Creator to the extent you receive pleasure from reception. Most importantly, when overcoming disturbances, don’t let spirituality in you grow weak, and definitely don’t let it escape you altogether! Strengthen your drive towards the Creator and exert your heart to this end. #Faith above knowledge is the sensation that bestowal is above reception, the Creator’s importance is above that of all reality. One starts to feel that he now has a new concern: to do something for the Creator’s benefit, but without the Creator’s knowledge of it, without any reward. The Torah is a special program of existence, a force capable of connecting all parts of reality. All elements of creation connect by countless connections in one #harmony, to express the Maker Himself by the force of the desire that was created by the Creator. Rising above #egoism, we’ll tune into the common memory and start to understand each other. This memory is nature or the Creator, encompassing eternal movement—the #Soul! It’s written: the Creator gives the soul and man returns it to the Creator? It means: the Creator awakens a desire (#suffering) in man. Man turns to the Creator with the respective plea. The Creator corrects the desire. Man returns this to the Creator. The Creator fills the desire. All causes, effects, and actions are aimed at bringing the creatures to perfection by making them similar to the perfect system of nature. This is the plan of creation. We weren’t punished by being created opposite to the system. On the contrary, the system wishes to turn us into creatures that will match it precisely: that will know, perceive, feel, and govern this entire system. There’s nothing extraneous in the world, lacking a cause and effect. The group and I #charge each other like a battery. We inflate each other with air like a wheel, and create lack of air: ascents and descents. Our common Kli accumulates many #forces (+ and -), reaching the size/capacity when the Creator is revealed inside our proper #connection. Communication and teamwork skills are paramount today. Israel is increasingly lagging behind in the rating of the most cited scientific works. Jews are strong on the individual level, but they are repelled by group work, due to the unfounded hatred that arose 2,000 years ago. Wishing to become like the light—to bestow to others—I turn into a spiritual Partzuf. I restrict my will to enjoy and connect to other desires, which become my 9 Sefirot. I bestow to them like Malchut. And every person in the ten does the same. There’s no greater pleasure than revealing the Creator. It fills the horizon. Everything is seen only upon this background, which illuminates all reality. We must connect all reality to the Creator, see it only as a means to reveal His greatness. The Creator receives pleasure when creation enjoys Him. Equivalence with the Creator means giving Him pleasure. I must check whether I feel the Creator’s greatness. If I am not overfilled with joy about living in the Creator’s world, it means I lack His greatness. The Creator’s mind is bestowal, faith. Man’s mind is knowledge, reception. Acquiring the Creator’s mind means acquiring bestowing, loving desires. We hence agree to any conditions—let the Torah give us the will to bestow instead of self-gratification so we’ll worry about others instead of ourselves. The Torah gives us all this, but we must first arm ourselves in the group with the respective desire. – On the other hand, we desperately want to achieve all this. We come to the reception of the #Torah when we genuinely need the desires to bestow, and desire nothing but this. For this we’re ready to “wander the desert, cross the Red Sea, go through all the Egyptian plagues”—as long we acquire the desires to bestow. There’s no way to reveal the Creator except by uniting broken desires, pinpointing the form of connection and adhesion with the Creator. #Torah leads us to its Giver, which is paramount as it opens up a new world to man. One is rendered speechless upon revealing the magnitude and loftiness of the gift bestowed upon him. When experiencing a problem, I understand that it comes from the Creator to incite me to rise to His degree. I therefore ask for the force of His greatness, to rise to the degree of faith-bestowal above the problem-knowledge. Question: Do spirits, poltergeists, angels, and demons exist? Answer: There are no witches, ghouls, devils, demons, or other evil spirits. These are all qualities of a person. In Kabbalah, there are many names of both pure (altruistic) and impure (egoistic) forces. However, they are all inside a person. It does not mean that we need to cast out demons. We must correct our egoistic qualities. Do not imagine them in the form of an image. Do you want to change something? Then, just change yourself, your egoism. Let’s say that yesterday your egoism was -20 and today it is –10. This means that you have cast some “demon” out of yourself. Question: Can a Muslim, Christian, Buddhist, or any other religious person be a Kabbalist? Answer: It is not a matter of faith. What matters is that a person who was told something, has read, or somehow received information, accepts it as a belief, meaning he uses it as data, as a fact. In this case he is called a believer. Kabbalah is not a faith. It is a science that researches something that is unattainable for an ordinary person. However, every person can achieve and discover the new spaces and new forms. This is even discussed in physics today. It confirms that there is matter, energy, spaces, and volumes that we cannot sense. There is movement above knowledge, above light and time, and beyond time and space. It seems as if science starts discussing this even though a person does not enter it with his own senses. He pictures this solely in theory. However, the wisdom of Kabbalah helps us develop sensory organs within us that will enable us to feel and sense spaces beyond time, matter, or dimensions, and to exist within them. These spaces are considered spiritual. Question: Do I have to believe you? Answer: You don’t have to believe me when I tell you that this exists like how you don’t have to believe physicists who tell us that the light disappears, that there are white and red dwarfs, other universes besides ours, and so on. You don’t have to believe them or me. It all depends on whether you desire to attain it yourself, whether you think that it is important to you. If it is important to you, then you are invited to travel to “another world.” If this has no importance to you, then stay in this world. Good luck! In the new life, we will no longer fight with each other; rather, each one will fight with his ego that hinders his connection to others. The younger generation is discovering that the ego no longer functions as a way to attain fulfillment. Human nature must change so that we learn to enjoy life together in an infinite way rather than in a limited egoistic fashion. There is a north star guiding us to exit this life into another eternal dimension where we will feel like one body. We will live as one soul connected together and our pleasure will be experienced through mutual complementarity.